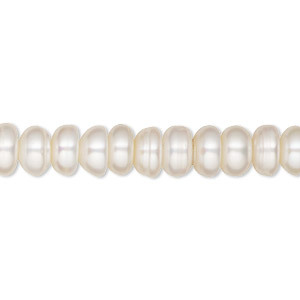 Pearl, cultured freshwater (bleached), white, 7-8mm button, C grade, Mohs hardness 2-1/2 to 4. Sold per 16-inch strand. Item Number: H20-6449CK Have a question about this item? Pearls imbue the essence of elegance and style. Since pearls are a natural material, color and sizes will vary. Pearl, White Lotus, cultured freshwater (bleached), white, 4.5-5mm button, C grade, Mohs hardness 2-1/2 to 4. Sold per 15-1/2" to 16" strand. Pearl, White Lotus, cultured freshwater (bleached), white, 8.5-9mm button with 1.7mm hole, C grade, Mohs hardness 2-1/2 to 4. Sold per 15-1/2" to 16" strand. Pearl, White Lotus, cultured freshwater (bleached), white, 5.5-6mm button, C grade, Mohs hardness 2-1/2 to 4. Sold per 15-1/2" to 16" strand. Pearl, White Lotus, cultured freshwater (bleached), white, 8.5-9mm button, C grade, Mohs hardness 2-1/2 to 4. Sold per 15-1/2" to 16" strand. Pearl, cultured freshwater (bleached), white, 5-6mm button, C grade, Mohs hardness 2-1/2 to 4. Sold per 16-inch strand. Pearl, cultured freshwater (bleached), white, 8-12mm rustic button, C grade, Mohs hardness 2-1/2 to 4. Sold per 16-inch strand. Pearl, White Lotus, cultured freshwater (bleached), white, 7.5-8mm button, C grade, Mohs hardness 2-1/2 to 4. Sold per 15-1/2" to 16" strand. Pearl, White Lotus, cultured freshwater (bleached), white, 6.5-7mm button, C grade, Mohs hardness 2-1/2 to 4. Sold per 15-1/2" to 16" strand. Pearl, White Lotus, cultured freshwater (bleached), white, 9-10mm button, C grade, Mohs hardness 2-1/2 to 4. Sold per 15-1/2" to 16" strand. Pearl, White Lotus, cultured freshwater (bleached), white, 7.5-8mm button, A- grade, Mohs hardness 2-1/2 to 4. Sold per 15-1/2" to 16" strand.